My family continued our tradition of bouncing around the globe for Christmas Eve dinner. This year, we landed on North Africa! This is a region we’ve never explored which meant experimenting with lots of new spices and flavors. We were inspired in part by Golden Beetle, a new Mediterranean and North African restaurant close to my parents’ house in Ballard. My mom and sister and I actually did some of our menu planning over lunch at Golden Beetle. We sorted out the last details and received some final inspiration while sampling Golden Beetle’s delicious and exotic cuisine. The evening was kicked off with Pomegranate Bellinis and appetizers. We made several tasty dips which we served with warm pita triangles. The Chevre with Pistachios and Honey was surprisingly delicious given how few ingredients the recipe called for. The Muhammara was the true hit of the evening. 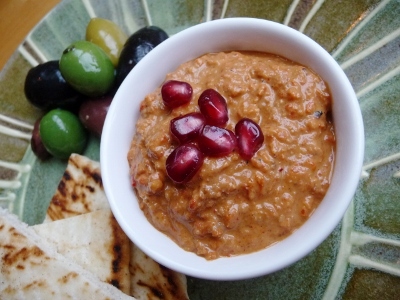 Muhammara is a walnut and roasted red pepper dip flavored with cumin and pomegranate molasses. It is fruity and spicy and quite exotic. My mom loves the Muhammara at Golden Beetle. Ours turned out different from theirs but no less delicious. Rounding out the appetizers was a Fava Bean Puree, Marcona Almonds, and Mixed Olives. The appetizers threatened to steal the show, but the main dinner certainly didn’t disappoint. Our two main courses were Moroccan Spiced Lamb Meatballs with Yogurt-Mint Sauce and Fish Tagine with Preserved Lemons and Olives. The fish turned out excellent, especially considering that we sort of made it up as we went along (ours was loosely based on this recipe from Paula Wolfert). The fish is marinated in a charmoula sauce made from cilantro, parsley, paprika and preserved lemons. After marinating, it is layered in a tagine (or large pan in our case) with sliced carrots, celery, green bell pepper, tomatoes and more charmoula. This is then topped with olives and preserved lemon peel (we actually used fresh lemon slices since they looked prettier) and cooked over low heat until the fish is done and the vegetables are tender. It was a very spicy and flavorful stew which I am looking forward to making again. Side dishes included Saffron Couscous with Toasted Almonds, a Spinach Salad with Harissa Vinaigrette, and Roasted Cauliflower and Shallots with Chard and Dukkah (recipe courtesy of Seattle’s own The Corson Building). Dukkah is a very interesting Egyptian spice mix made from hazelnuts, sesame seeds, coriander seeds, and cumin seeds, all toasted and finely ground. It was so tasty that I couldn’t stop snacking on it throughout the day. Even my two year-old nephew kept asking for more. This year’s Christmas Eve feast was somewhat experimental for us, but it turned out fantastic and we came out of it with several new favorite dishes. I plan on making Dukkah on a regular basis (as a topping or possibly just as a snack) and given how much she raved about it, I’m pretty sure my Mom will always have some Muhammara on hand. I’m excited to find out where in the world we will land next Christmas! Add the walnuts and bread crumbs to a food processor and process until the walnuts are finely ground. Add the remaining ingredients and process until smooth. Add salt to taste. Serve with warm pitas.